As soon as we start an online store, the second thing we worry about is “How to choose the right payment gateway“? The first is, of course, getting our product ready. Since we are in a customer-facing business, we need to accept payments either in cash or online. And now, when digital payment methods are so common and account for 70% of all transactions, choosing the right payment gateway can be a smart business decision to make. For anyone unaware of what payment gateways are? Let’s start with a quick introduction to terms. Payment gateways: Any payment gateways let the seller accept customer payments on their websites. They provide a secure gateway for transferring customer’s information to the banking body. Merchant Account: It is the seller account with the merchant bank. The merchant bank accepts the payments from customers and deposits them into the merchant account. Payment Method: It is the method any customer chooses to pay for the products and services from the seller. Some widely used payment methods include credit or debit cards, online payment services, bank transfers, cash on delivery, checks, and money orders. Since our goal is to have a hassle-free gateway that fits our business model. We’ll choose a payment gateway that allows us to create a payment scenario which is really simple, fast and user-friendly for our products or services. No one likes to fill in lengthy forms asking for less required information. 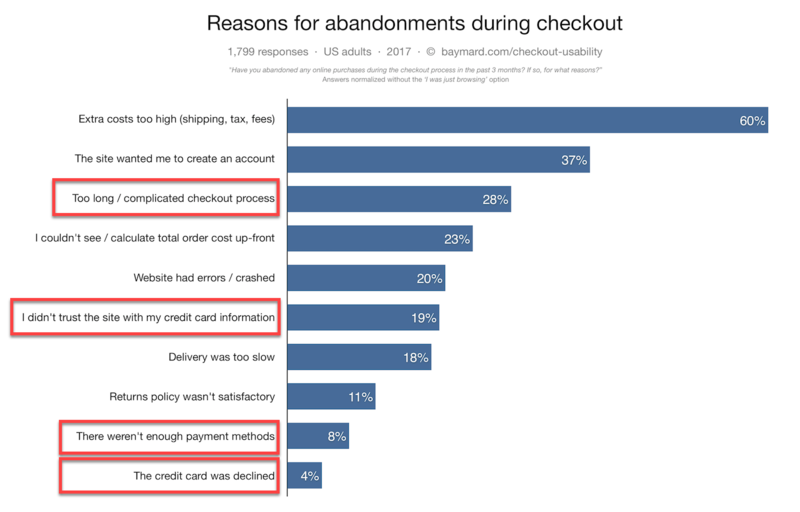 Any inconvenience during the transaction may lead to cart abandonment almost 70% of the time. Thus, payment forms that are secure, easy to use, quick to fill and provide effective messaging are crucial. 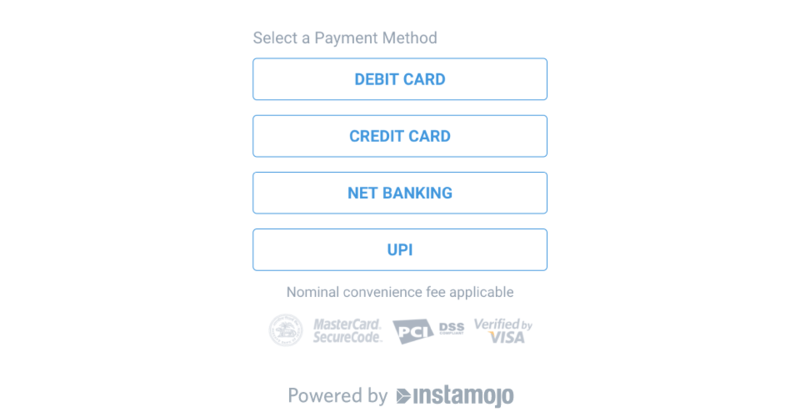 The appearance of payment forms may decide not only upon our conversion rate but also it can also create a lower or a higher trust from our buyers. The simple appearance of the form. Simplicity and Transparency of the gateway. Transaction happens on our website or it is redirected to some third-party. Customization of traits or messages. We should check if our gateway which accepts, process, store or transmits credit card information maintain a secure environment or not. They should ensure the protection of Sensitive Authentication Data, which includes full magnetic stripe data, CAV2, CVC2, CVV2, CID, PINs, PIN blocks and other data. Read more about PCI Guidelines. Classic Type of Gateway: These gateways require the Merchant Account to be directly associated with the bank. This makes transaction process swift. Moreover, the transaction fee is very less compared to the Modern Type of Gateways. This type of gateways is most suitable for large enterprises, which operates with a high amount of daily transactions. But for small companies, it can be a bit problematic. Classic Gateway needs a long time to set up, low integration flexibility with APIs, and a merchant account. Some popular Classic Gateway is Authorize.Net, WorldPay, and 2Checkout. Modern Type of Gateway: This type of gateways don’t require us to have a merchant account. Its setup is easier compared to Classical Type. But transaction charges are higher than Classical Type. This type of gateway redirects customers to the payment site. And if the redirect is slower, it can cost our conversion. Some popular examples of Modern gateway include PayPal and Stripe. If our payment gateways give us the option to choose the countries where we want to sell, it is well and good. The gateways should cover most of our target customers. We should establish that our gateways include considerations for future expansion in our business. Before landing any decision we should also understand the different markets and their preferred payment methods. We should also consider which service providers are predominant in the market and have the maximum users. Because it’s not just about entering a market, it’s about successfully meeting the needs of those customers. Such type of gateways redirects the customer to their platform. Transactions take place once the customer is redirected to the host site for validation. The greatest advantage of such payment gateway is that the offsite provider is solely responsible for any PCI compliance and data security. But, this type of processors is not very popular in few countries of the world. This makes it difficult for us to understand what the users think of this type of gateways. However, we do know that redirecting customers to a different site, no matter how trustworthy it is, is not liked by a lot of our customers. This connects our online store with a pre-delivered API fro the gateway service providers. And this integration helps our customers to complete the transaction from our sites itself. This ensures a smooth and seamless buying experience for our customers. Here we need to be a bit cautious about our selection of any particular integration. As they may be very limited in their ability of a perfect integration. We may require customization of the gateways so that they integrate in a proper manner. at XAdapter’s Marketplace. 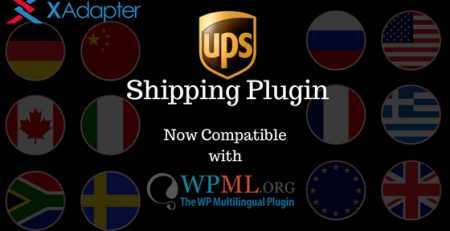 Almost all card types are supported by the Integration API in all countries around the world. 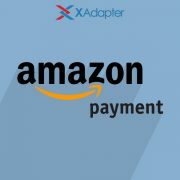 With an innovative development partner like XAdapter, you can always add a wide range of additional features. Features like Cross-sales or “Remember me”, multilanguage checkout, one clicks upsells(a function that allows returning clients to conduct payments with a single click) can be added to their Premium Integration API on request. Addition of these features can certainly increase sales and profits. 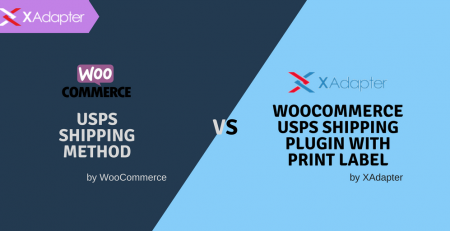 WooCommerce stores have been an easy target for online payment frauds and monetary discrepancy incidents. As safety is required for both the merchant account and the clients and their financial information. It’s a collective responsibility of the user and the service providers to act for the security. So while ensuring a safe payment gateway we should ensure that all data encryption, VeriSign SSL certificates and CVV2 verification and any other relevant encryption algorithms is up to date with our service provider. We should also make sure that the service provider is providing fraud protection and offer an anti-fraud system with an active chargeback management. Token technology is a next level in security. We can use this to replace card digits with a meaningless number, which stops fraudsters from cheating our websites. Adding this technology to our websites can help us protect our loyality and prevent card abuses. We want our customers to feel that we’re a genuine store and care about the security of their financial credentials. This requires the acceptance of payment from a wide range of service providers. It is because having a single obscure bank account, credit/debit card option will have a negative effect. It reduces the trust any buyer will have on us. Having more number of options in payments, not only increase the trust of our customers but also give us the access to buyers using different types of payment options. 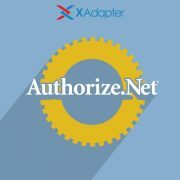 For Instance, Authorize.net Payment Gateway brings Visa, MasterCard, American Express, Discover, JCB, Diner’s Club etc. to our store. Further, according to WorldPay, alternative payment methods (other than debit and credit) are going to account for up to 59% of all transactions in 2017, and our payment gateway must be able to handle that variety. There is no need to highlight the need for swift execution of transactions. Any lag in the process of the transaction will raise a doubt in the minds of our customers. This directly hits the trust they have with us. And next lag leads to abandonment of the cart. Since transaction speed is important for our clients; we should avoid gateways which don’t have the necessary capacity to complete the transaction swiftly and leave the customers hanging. While difficult to test, speed is an important consideration. Look for reviews and other reputational factors to determine actual performance. Of course, reputation is crucial for numerous other factors such as support and stability, so do our due diligence. Before taking any service, we need to know and understand the fee structure in advance. And then we should go for the one which is the easiest to understand and the simplest to execute. Since we have our money involved, there should be no room for any surprise or lack of trust. Sometimes we get excited seeing very competitive fees on paper and may think this is how much we will end up paying. Unfortunately, some payment gateways charge additional fees for certain services or the fees they display will follow only if we meet certain conditions such as local traffic, minimum volume required or refer to just one currency. Here is a quick reminder! Don’t fall for lucrative fee structure on paper. Make sure there are no hidden fees and the pricing policy is transparent. Enquire and confirm everything before integrating our store. Have everything documented to avoid unpleasant surprises of paying more. and any other fees, based on some scenarios. Evaluation of the overall cost to our business is also an important factor for choosing a payment gateway. What is the average transaction amount? 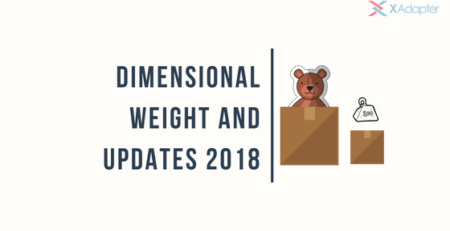 How much transaction volume do we anticipate? How steady will it be? Do we value simplicity of integration/operation or lower costs? What extra services are we looking for? So, we might opt for a higher fixed monthly fee, but with lower transaction costs, or vice-versa. We might opt for a variety of advanced services, or choose a bare-bones lowest-cost option. By thinking through these questions, we’ll have a strategy for getting the pricing model that is best for our needs. Thankfully, we have several outstanding options to choose from when it comes to payment gateways. Most service providers claim to transfer funds to our merchant account within 3 business days. PayPal deposits that within few minutes. Now, there will be variations in this time slot, but it’s our responsibility to consult people who are already using such gateways and choose the most consistent one. We should be aware of the payout schedule. if any. And any such schedule must fit nicely in line with us paying for our suppliers. Any gap in the cash flow is the last thing we expect. Gaps can have a diverse effect on various levels of our business process. Recall the annoying feeling that we go through Internet banking and the time we want to speak to someone and instead had an automated response or an FAQ. We have wasted our time and were left lost & upset. We don’t expect that. Do we? Automation has its limits, with advantages. So choose a service which has a fast response time and resolves all issues swiftly. 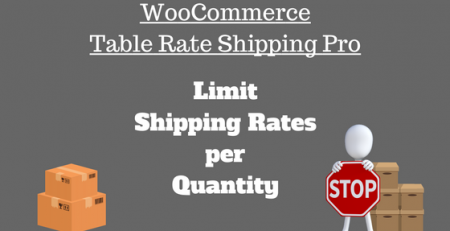 This is important as payment processing is critical in every eCommerce business. Sometimes it is not at all necessary to have a 24×7 service. But it is important to have all services which we need. We should know, where to look for support, as we can’t wait for long hours for responses. Any good payment gateways should assign an account manager in case of any help we might need. Integrating our online store to the right payment gateway is certainly an important business decision. Speed and reliability of transaction and service provider will decide what our future customer thinks of our business. Swift and reliable gateway ensures the success of our stores. Also, the technology of payments is advancing fastly, so any research we do will always help in deciding the direction of our business. Changing the provider with time may not be the best option. As it will ask for time and work. So its basically good to choose a smart gateway, that can adapt really fast. Finally, when after choosing a payment gateway, we should be aware all legal restrictions that affect our venture. For example, We need to do additional identity checks of customers, when they cross a certain maximum limit in China to continue using the account. Also, if an account type or account owner has a higher risk of money laundering or terrorist funding, then it’s subject to enhanced due diligence (EDD) in Canada. So, we should take time, do some study and follow general customer reviews. For sure it will be tedious but is worth our time and money. If you are using WooCommerce as your platform, find the best Payment Gateway Integration API from our product page. Contact our online support for pre-sales inquiries. Feel free to leave a comment, we’ll be happy to respond to your queries.